I had to change every to each to get the syllable count right, but you get what I am saying. In pursuit of this idea, I am taking the month of April to create a personal “runway collection” based on the sewing patterns in my stash. As I have mentioned before, I just discovered the indie sewing pattern culture on the web, and I have flung myself off the high diving board even thought I am a terrible swimmer to join them. I have always had a vintage pattern collection. The dumb thing is most of them are not my size. And of course, my personal pile of patterns from all the years I have sewn. 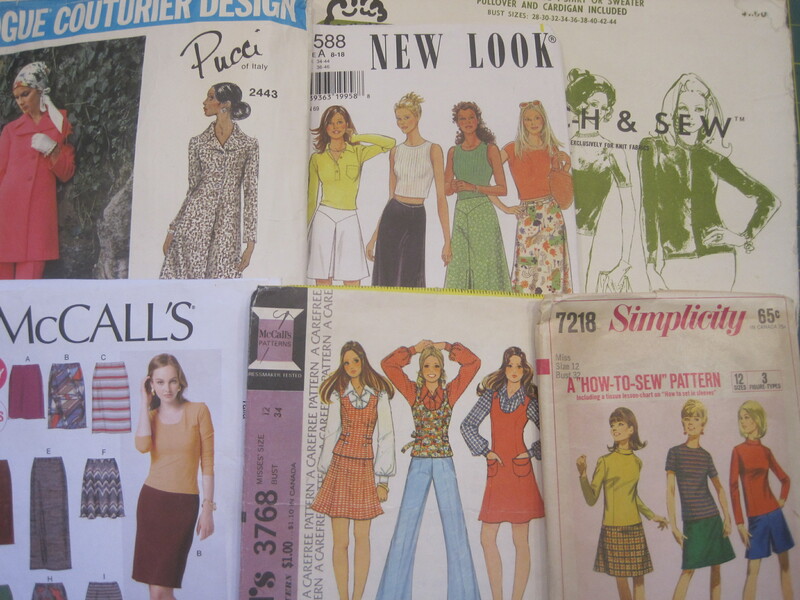 Some of my original 1980s patterns are now vintage! I know the indie patterns are what is cool right now, but Marcy and Katherine Tilton’s long time dedication to the home sewists can’t be ignored. Plus they just might be the reigning queens of KNIT. I’ll be using repurposed materials, vintage fabrics, and whatever else is in my stash. 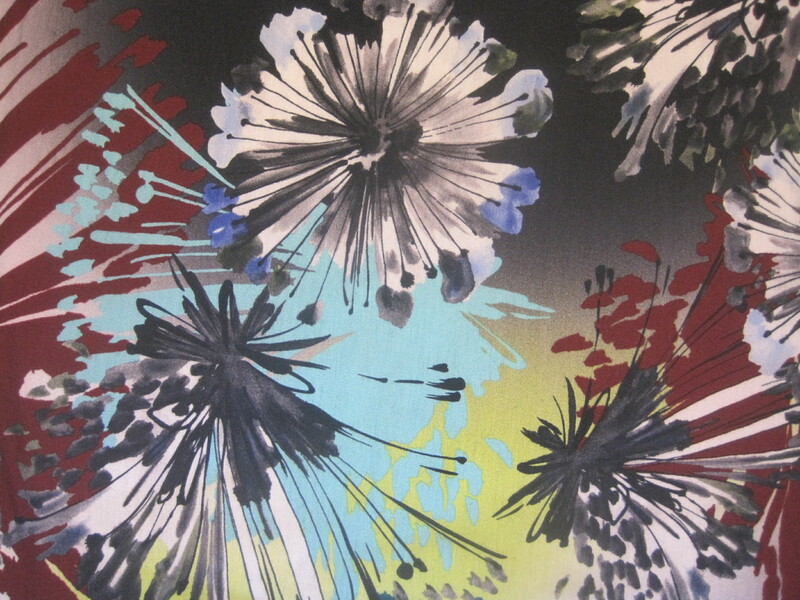 Here is the fabric I am using to build my palette. Here is my palette as of today. Now for the really scary, I mean, fun part. For the month of May, I am going to wear only the clothes I have made. Everything but the under and the outer I am making and wearing. I got the idea for this part of the adventure from reading about Me Made May. This is an online project where sewists are encouraged to wear what they make for the month of May in whatever capacity they feel comfortable. In that same What’s Next? post, I also wrote about being influenced by several contemporary artists who are using clothing as a form of social protest. As my oldest son would say, I am picking up what they are putting down. Wearing my own clothes for the month of May is my teenie weenie contribution to that conversation. Can I do it? Last year, I was awarded a Rasmuson Fellowship to take my patchwork off the wall and onto the garment. I wanted to use repurposed fibers and quiltmaking skills to create clothing with a sub-arctic aesthetic. Since I wrote What Next? I have seriously been trying to sew garments by exploring a wide variety of fibers and techniques. Consequently, I have discovered even more things I did not know. This is HARD to do. Another way to put is What was I thinking? My rock solid quiltmaking skills are helpful, but garment construction is its own bag of tricks. You have to know how to make jeans before you can draft a pair of jeans. Learning how to draft patterns takes time–people go to school for years to learn this skill. In the world of garment construction, manipulating woven cotton is kind of kindergarden. Sewing with silks, wools, or oh-my-goodness knits is a skill worthy of the Olympics. Using re-purposed materials is its own variable/complication. When I started making quilts I used a pattern and perfected my construction skills. Yesterday, I watched a thirty minute video on ironing for garment construction. WOW. I’ve never used a clapper before, have you? Once I got real about my strengths and weaknesses here. I needed to revise my plan and move forward. I really wanted to have a final project–a real demonstration of what I did with my Fellowship and this it. Part of me is like WHAT? The Rasmuson Foundation awarded you a Fellowship to make and wear your own clothes. Are you dreaming this stuff up? Nope. I am not. It is for real. And in the process I will improve my garment construction skills, create with an assortment of new and used materials, learn some drafting and pattern modification techniques, stitch and wear only my own clothing, and, well, who knows what will happen next. But, it all starts now. 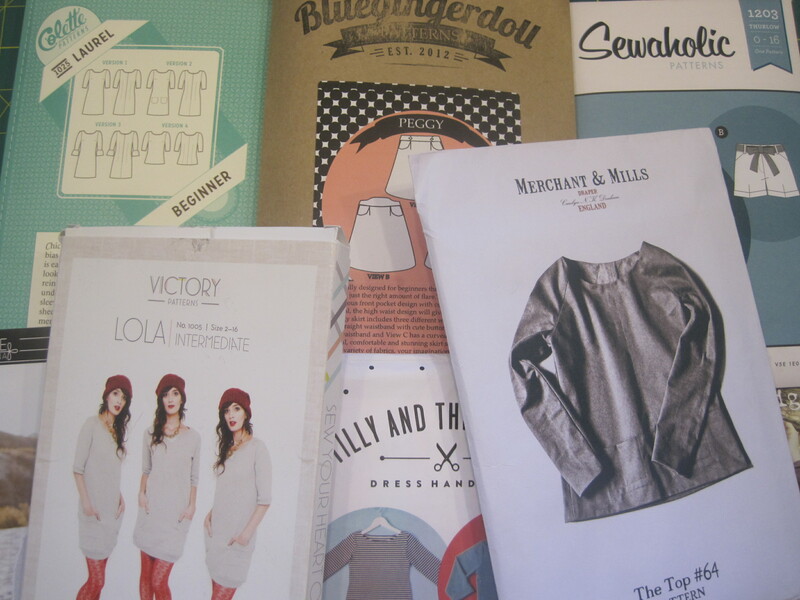 Do you have a stitching adventure planned for April? Don’t be shy, it is good to share. 02 Apr	This entry was published on April 2, 2014 at 1:41 PM. It’s filed under News And Events, Sew and Sew and tagged Me Made May. Bookmark the permalink. Follow any comments here with the RSS feed for this post. You are so-o-o-o-o cool! I love this challenge AND this blog. Thank you Sue. I must say, that it is kind of a dream challenge for me. I am so excited to be doing this! I have moved past my knit fears and on to jeans anxiety. I thought I was through with making garments but reading this post has me thinking about making a couple of jackets to wear with everything – like when I have to put on real clothes and go to a wedding or funeral or something. I even went ahead and ordered a four-dollar book on Amazon just in case it has some fantastic ideas. Thank you for sharing your adventure! Thank you Susan! As I sit here wearing my newly sewn knit t-shirt, I must say there is something very empowering about wearing your own clothes. I hope you give it a try. Good luck Maria! As I was reading all of this I thought of Jillian’s blog on refashionista.net, you might find some of her ideas quicker to work through especially if you are repurposing clothing. 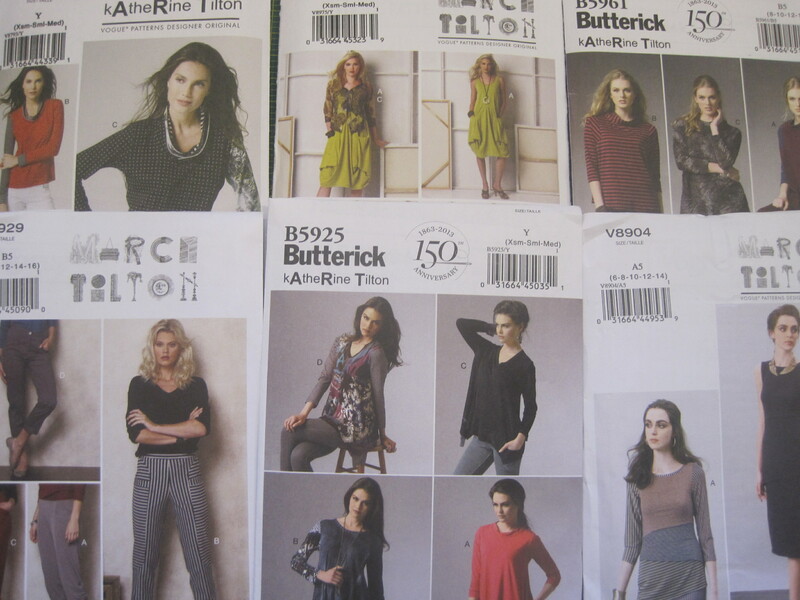 I learned to sew with knits using Christine Jonson’s patterns, they might work well with all of your wool. Thanks Diane I will check out all of your tips. I am mostly using thrift store finds as fabric. I haven’t gotten into refashioning YET, but I do see it happening down the road. Looking forward to seeing what you make. Love the “floral” that you used at the head of your post. Loved the old Stretch and Sew techniques for working with knits…not haute couture but very effective for getting nice finishes on knits. Thank you Kate for the tip. I will have to look into the Stretch and Sew techniques. I’ve gotten a lot out of watching a Craftsy video by Marcy and Katherine Tilton. They really know their knits! Stitching goal for May is to make new covers for the faded porch cushions once red, now pink. Pink stinks so I shall invest in Sunbrella fabric this time around to see if it can repel Old Sol’s UV rays. To keep blowing rain from rotting the foam beneath I first wrapped the bench cushions in heavy duty black vinyl and to my surprise it makes the slipcovers slide on oh, so EZ. Even the blind chick finds some corn. Clothing will have to wait until summer when it is too hot in SC to wear anything but a bathing suit but I might find time to think about fall colors while I hibernate in the AC. I am always amazed at how much damage the sun can do over time. Really any weather for that matter. I hope the cushions go together easily and your summer is mild enough that you get to enjoy them!